Low back pain is a significant burden in terms of pain, disability and loss of quality of life for those who experience it. This is a global problem with data in Australia revealing that a quarter of the population having it any one time. The fiscal burden is reported to be about $5 billion a year of direct costs and indirect costs to be much the same again. We know that quality of care is variable with research in primary care suggesting that fewer than 50% of people presenting with low back pain have a physical examination, and only about 25% have a neurological assessment. National Health and Medical Research Council guidelines recommend that imaging is unnecessary for acute low back pain unless there are signs suggestive of a serious condition. Yet 25% of patients are referred for imaging after their first consultation, resulting in unnecessary Medicare expenditure. The model of care is designed for people presenting to health practitioners in primary care settings but will also be the guide for care in settings such as emergency departments. 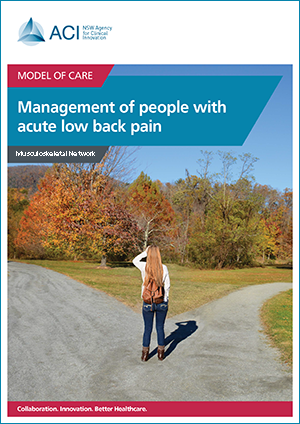 The consumer information document Best practice care for people with acute low back pain has been developed to support the community’s understanding of what the model of care aims to address and why. For more information, please contact the ACI Muscoloskeletal Network Manager.